Would you know what to do in a cardiac, breathing or first aid emergency? The right answer could help you save a life. With an emphasis on hands-on learning, our First Aid/CPR/AED courses give you the skills to save a life. All course options align with OSHA’s Best Practices for Workplace First Aid Training Programs and are available in classroom and blended learning formats. A digital certificate is issued upon successful course completion with anytime, anywhere access to certificate and training history. Free online refreshers are available with all course options. Brand new Simulation Learning training method now available for all course options. Simulation Learning is an immersive online learning experience that allows you to make decisions – and mistakes – without fear, followed by an in-person skills session. First Aid : Learn how to respond to common first aid emergencies, including burns; cuts; head, neck and back injuries and more. Pediatric option available. CPR/AED Learn how to respond to cardiac and breathing emergencies in adults, including the use of automated external defibrillators (AED). Adult and infant/child CPR options available. 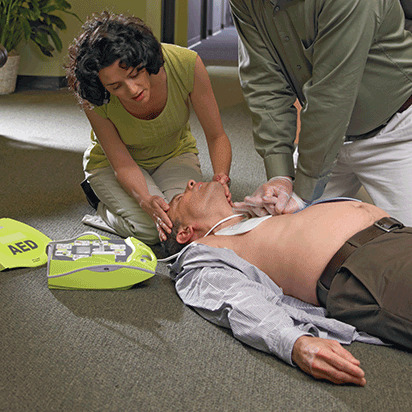 Review Renew your First Aid/CPR/AED certification in an abbreviated class session. Current certification is required. Challenge Prepare on your own and demonstrate skill competency in front of a Red Cross instructor. Current certification is not required. This training module is designed for first responders, health care professionals, lifeguards, and other workers who are at risk for on-the-job exposure to blood and body fluids that can cause infection. This course helps to meet training requirements for the OSHA bloodborne pathogens standard. Course length: 2 hours classroom; 1 hour for online course. Designed specifically for high school and college students, this class provides a comprehensive set of skills that may enable you to save a life. You’ll be certified in both First Aid and CPR/AED, and be prepared to respond to a variety of emergencies involving infants, children and adults.